In 1979  the same year as Coventry band The Special AKA (The Specials) released their debut single Gangsters  Martin Bowes, influenced by London based fanzines such as Sniffing Glue together with the DIY effort of Punk Rock, decided to create his own publication Alternative Sounds covering music from Coventry and Warwickshire. The magazine quickly established itself as the go-to read in the local area, with 18 issues produced over a two-year period. Martin also pulled together a vinyl compilation album Sent From Coventry that appeared on Kathedral Records. In 2017 he revived Alternative Sounds to support fundraising at The Coventry Music Museum by releasing a 500 limited edition vinyl 7 E.P. and Alternative Sounds Volume 1. 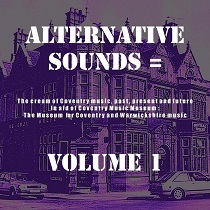 Each 21-track volume features music from Coventry and Warwickshire acts (Pop, Ska, Mod, Roots) from the past and present. Highlights include: The Primitives (Never Kill A Secret). Formed in 1984, splitting in 1992, and reforming in 2009, this Coventry band are best known for their 1988 international hit single Crash. Roddy Radiation & The Skabilly Rebels (Heartbreak City). Roddy Radiation aka Roddy Byers was on the music scene in many bands, including The Wild Boys, The Tearjerkers, The Bonediggers and most famously The Specials. Lieutenant Pigeon (The Boots of the Rosewood Brigade  previously unreleased!). The band developed as a side project from the band Stavely Makepeace. The band came to fame with the 1972 number one hit Mouldy Old Dough. Many of the tracks are now rare and/or exclusive to this collection. EXCELLENT! !